Do you hear loud noises under the hood when you turn on your air conditioner? Does your A/C system only blow cool air sporadically? If so, it’s time to get your vehicle’s air conditioning system checked. It’s really easy to take your car’s air conditioner for granted, we are so used to simply pushing the right buttons and out comes cool, dry, clean air. However, your air conditioning system needs attention from time to time to keep it performing at its best. When most people hear the words “air conditioning problems,” it sends a shiver up their spine. That is because the air conditioning system is fairly complex, with lots of parts, and when it’s broken, it’s expensive to repair. What can we do to prevent air conditioning breakdowns? A common cause of air conditioning failure are leaks. Refrigerant, (the stuff that makes the air cold), can leak out if the system if a part has failed, such as a hose, 0-ring or evaporator. When refrigerant leaks out, the system loses its ability to cool, and it must be properly repaired. Simply adding more refrigerant to a system with a leak is not a correct repair, and it is also illegal. You should also run the air conditioner regularly, even in the winter, so it lubricates itself and keeps the seals from drying out, which leads to leaks. Of course, if your system is not working right, now is the time to get it checked. New environmental laws have halted the manufacture of Freon (R-12), a refrigerant that was used in cars made before 1993. Today, there remains a very limited supply of R-12 and the price is very steep. If you have an older vehicle that uses R-12, you should consider having it updated to use R-134a refrigerant. It will pay for itself in the long run. So, if your A/C is simply blowing a lot of hot air, bring it to us for an inspection. Often, repairing your car’s air conditioner can be done on the same day it’s dropped off; however, it is impossible to diagnose your vehicle’s A/C system over the phone. Bring your vehicle in for the correct diagnosis. We have all of the latest equipment to guarantee the correct repair. All vehicle A/C repair shops should verify that your air conditioning system is not leaking. This will ensure that your vehicle’s A/C repairs are not temporary. An external inspection can determine if there is an internal or external problem with the system. Repairs to your car’s air conditioning may range from replacing the compressor to simply recharging the system. Often, a small electrical problem may cause your vehicle’s air conditioning to fail. 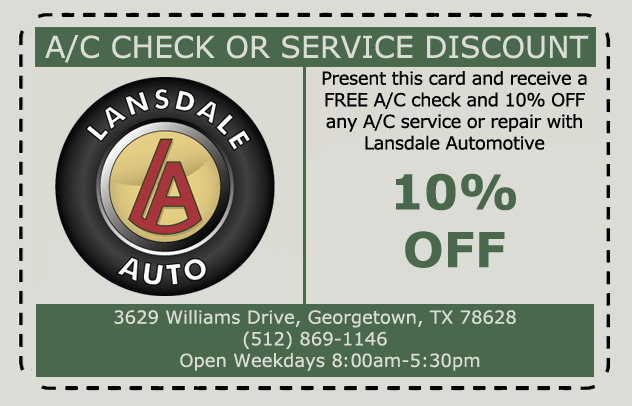 For proper diagnosis of the issue, bring your vehicle to Lansdale Automotive today! Be mindful of A/C repair facilities that do not have certified, vehicle A/C repair employees on staff!